October is National Pizza Month! If you’re anything like us, you don’t really need an excuse to grab a slice, but having a whole month to celebrate one of the most delicious foods in the world is a great reason to get in the kitchen, roll up our sleeves and make pizza from scratch! While there are a lot of components to homemade pizza, it’s actually pretty easy to make. We start with a simple dough recipe, featured below, add on our favorite sauce, whatever toppings we happen to have on hand, some great cheese, and we’re good to go. The hardest part is making the dough, but with a little planning, even that comes together easily. Ready to learn how to make pizza dough? Let’s go. Here’s our favorite dough recipe. 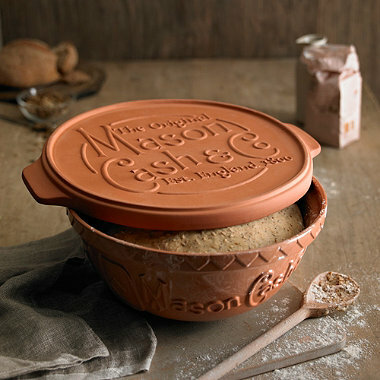 It makes enough for one small, thin crust pizza for 2 – the perfect size to bake on our Mason Cash Baking stone. If you’re making more pizzas, or like a thicker crust, go ahead and double or even triple the recipe. Another nice thing about this recipe is that it only uses one bowl, so you’ll have fewer dishes to do later! In a large mixing bowl, combine all the dry ingredients, including the yeast. Stir in the olive oil and water with a wooden spoon or spatula, trying to get the mixture as combined as possible. 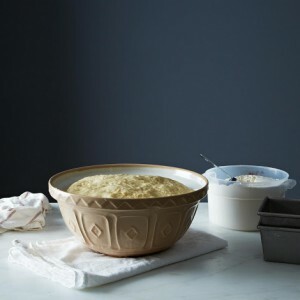 I love using a Mason Cash Mixing Bowl for this recipe (and all bread-dough recipes, really) since the bowls are roomy enough to knead in and glazed to make cleanup easy. Knead the dough right in the bowl until it is completely combined and uniform, then knead an additional two minutes. Lightly oil the bowl, cover it in plastic wrap, a damp towel, or your baking stone, and let the dough sit in a warm place for an hour or two, until doubled in size. If you want to make this the morning before, let the dough double in the refrigerator instead of in a warm place. Heat just speeds things up. Sprinkle your baking stone or a baking sheet (it’ll work, but the crust won’t get as crisp) with cornmeal, put it in the oven, and heat your oven as high as it will go. Mine tops out at about 525 degrees. 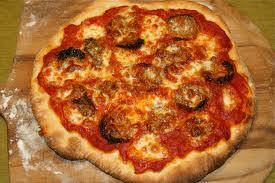 Roll out the pizza on a floured countertop, making sure it doesn’t stick to the counter. Top your pizza with your favorite toppings. If you’re using a lot of toppings, make sure they’re sliced very thinly. 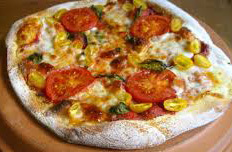 Meats should be pre-cooked, but vegetables can normally be put on your pizza raw. 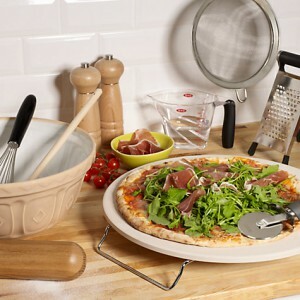 Using a large spatula, the back of a cookie sheet or a pizza peel, gently transfer your pizza to the hot baking stone. Bake for 10 minutes, or until slightly blistered and very melt-y. If you’re worried about transferring your pizza from the hot counter to a hot baking stone, go ahead and shape your pizza right on your stone, and put the whole thing in the oven. The crust won’t get quite as crisp at the bottom, but you’ll still have an incredible homemade pizza. We hope you have a fantastic time celebrating National Pizza Month, and we really hope that you take the time to make pizza from scratch. It’s a lot of fun, the pizza is outstanding, and it’s something the whole family can do together! This entry was posted on Friday, October 4th, 2013 at 5:00 pm and is filed under Baking, holiday, Mason Cash, Pacific Merchants, Recipes. You can follow any responses to this entry through the RSS 2.0 feed. Both comments and pings are currently closed.